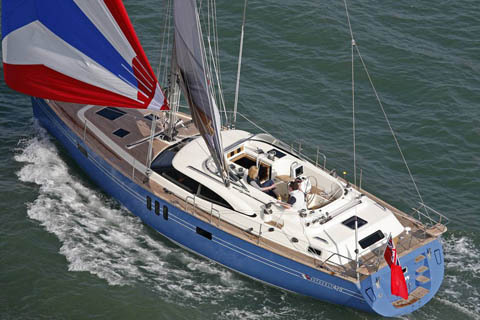 The New Southerly 420 centre cockpit, blue water cruising yacht, designed by Northshore and Rob Humphreys can be easily sailed by two people and boasts an impressive sail plan. The tall fractional rig with swept back double spreaders, combines a self tacking furling jib and large mainsail with single line reefing, giving a total sail area of 793 sq ft (73.62m2). 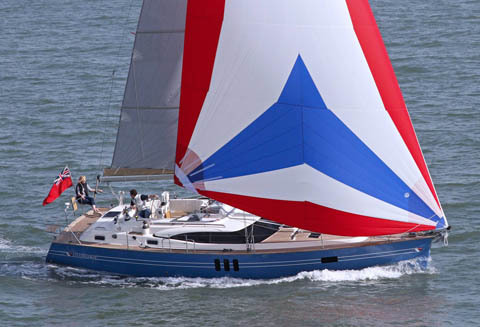 For off wind sailing, an optional gennaker can be flown from a removable stainless steel bowsprit. A modern well-balanced hull form with a long heeled waterline and broad transom provides the Southerly 420 with thoroughbred performance and sea-kindly motion. The steering is direct with minimum backlash with twin semi-balanced rudders to give instantly responsive steering and precise directional control. The propeller is protected by a substantial skeg that assists in stabilising the yacht when taking the ground. The optional bow thruster and stern thruster give the 420 exceptional low speed manouverability and control. The centre cockpit offers comfortable seating around the single helm station with space for full instrumentation. The mainsheet track is integrated into the aft cockpit coaming with the traveller control lines led to coaming self-tailing winches which also control the main and jib sheets. Secondary winches either side of the companionway handle the reefing and kicker functions making the yacht easily managed from the cockpit while underway. Coaming mounted winches easily accessible from the helm are part of the optional genoa package which includes tracks on the side decks. 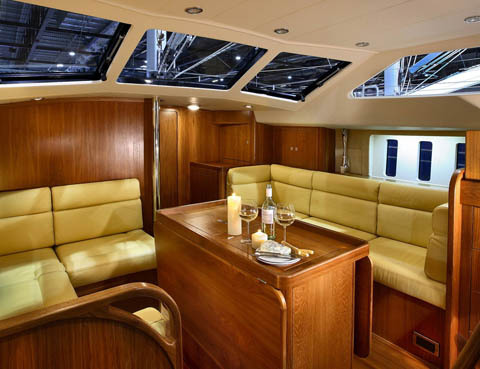 A teak table that folds against the pedestal when not in use offers alfresco dining capabilities in the cockpit. The stylish transom features a teak-decked swim platform with integral telescopic bathing ladder for water access, a fresh water shower and moulded teak surfaced steps to the aft deck. The spacious light and airy aft cabin boasts a large centreline double berth with seating both sides, plentiful stowage, superior ventilation and ensuite facilities. An option for a separate shower to ensuite facilities provides for added comfort. The large saloon seating area provides comfortable dining for six. Large coach roof windows provide panoramic ­visibility taking full advantage of all-round views. Two good size opening forward coachroof windows provide exceptional natural ventilation. The linear galley has large working surfaces with abundant storage, a stainless steel fridge, freezer, double sink and a fully gimballed cooker as standard. The large forward cabin is fitted with v berths, which convert to a double, with good storage, natural light and ensuite facilities. 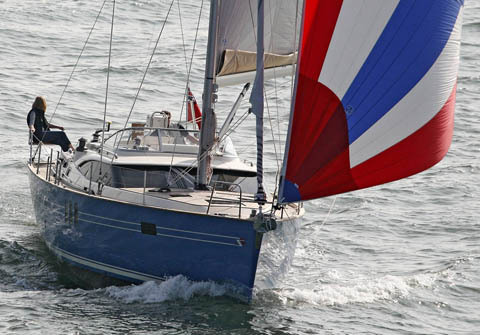 The highly developed Swing Keel design gives the freedom and versatility to sail in almost any waters. With the keel lowered, the variable draught of 8’9’’ (2.67m) makes for fast, serious passage making, with powerful windward performance. At the touch of a button, the keel can be raised, to give a shallow draught of just 2’7’’ (0.77m), perfect for exploring coastlines, shallow bays and inland waterways. The Southerly 420 conforms to EC category A.